The legends was established in 1999 in the center of Rome a few steps from the main station of Rome termini and by all means of transport. Legends is suitable for all categories of people, independent travelers, singles or couples, with friends or with family and especially for the groups created for all needs. We offer spacious and fully furnished dorms and private rooms. All rooms are air conditioned and most have a private bathroom with all accessories. Legends provide bed sheets, pillowcases, blankets, hot water, lockers Wi-fi and computers to use. Please note that we only accept guests between the ages of 18 and 50. People aged 16 and under cannot stay with us. Guests aged 17 must be accompanied by another guest aged 18 or older and have written permission from a parent or legal guardian. We are unable to send fax or letters for visa document applications to embassies and/or consulates. All bed linen and pillowcases are provided. Luggage storage is available at front desk if your room is not ready. Legends hostel for being top hostel 2009! Thank you very much guys! We owe you a lot from the bottom of our heart! Check-in: starts at 15:00 pm. Check-out: 10am. Notice about Rome's new tourist tax: Rome city council decided to charge 3.50 Euros per person per night on tourists who visit Rome. It is implemented from the September 1, 2014. We are sorry but this is unfortunately not included in the accommodation fee and have to be paid extra on arrival. A free glass of wine when I got there was nice and a good way to meet people. The location was also great, a block from termini and the bus station. I'll stay again when I'm in Rome. We stayed only one night ,the last one we spent in Rome ,and it was perfect!Located near Termini,the staff was really friendly and helpful.The room had lockers and heating(!!!! )The bed was comfortable with a thick and warm blanket.We finally were able to take a hot shower. something rare in Rome!in the morning a hot coffee and delicious croissants!Thank you Legends! This hostel is GREAT! I stayed for 4 nights. The free breakfast was yummy and the free wine at night was an awesome way to meet people and was a great way to bring people together. Definitely recommend if you are traveling alone! One of the nights the whole hostel lost power but they had it fixed by the next day. Very prompt, helpful staff. They were very nice and had great tourist maps. The hostel is incredibly secure! Kinda hard to find though so keep an eye out for small gold signs. Staff was very helpful but the location and the view from my room was AMAZING. There is a cute restaurant just next to the hostel and for some time there was live/street music. I loved it. It's really close to Termini station. 7-10 minutes by walk. Clean rooms. Free croissants. Thank you Legends Hostel. This was my first hostel and overall it was a pleasant experience. The location of the hostel from the main station was about 5 minutes which was convenient. There was little markets and eateries on the street if you needed anything. The staff was friendly and helpful always. Thank you, Tommy, for all your help. I definitely recommend the hostel. I even got to meet some great people who I explored Rome with. The only thing is there was no microwave in the common area in the annex--annoying. 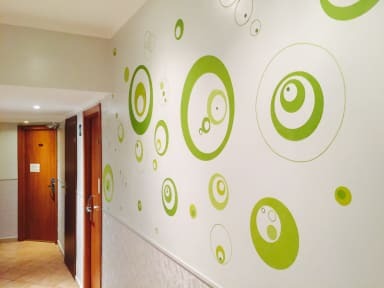 The hostel is in a really accessible location that makes it easy to navigate the city. I thought the facilities could have been cleaner, but overall everything was in decent condition. Breakfast was very light since it consisted of one croissant and coffee, but it was a good way to start the day. I think the hostel's biggest positive aspect is the social time in the evening where the hostel offers free wine and chips. It provided a great way to meet other travelers. We very much enjoyed our stay at Legends. The location is conviently close to Termini train station. Friendly staff and clean facilities. Warning-any early risers will be unable to receive free breakfast as it was from 8am - we we were up and out by 7:30am. The bathroom/toilet inside the female dorm didn't have a lock. The hostel itself was hidden within the street and difficult to find due to a lack of signage. However for the price, it was definitely worth the money and would visit again! 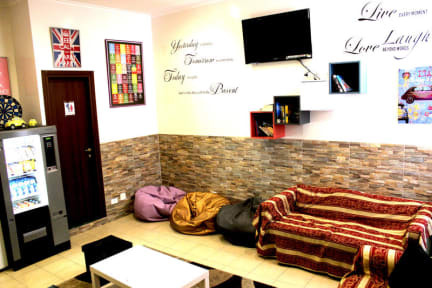 Nice basic hostel with what you need. It was a little pricey for what you get but that could be because it was the week before Easter. There's two buildings and you can tell that one is taken care of more than the other (like having legit coffee mugs at breakfast). Not a bad building, just needs some TLC. The staff in our building was great! He was talkative and funny. Comfy beds and hot water was readily available. Super close to the train station which was awesome!